If you need something larger than a luton van then you'll be glad to know that Edinburgh Van Rental also offer 7.5 tonne truck hire! Ideal for a large house removal or delivering bulk cargo, our range of 7.5t commercial vehicles are very popular with our business customers who can benefit from flexibility that other rental companies can't offer. In order to drive a 7.5 tonne lorry in Edinburgh, and the rest of the UK, you may need an additional category on your driving licence (C1). It's also important to note that if you'd like to use the truck for business purposes then you'll need to have a valid operator's licence too. Ready to hire a truck? Call us on 0131 207 0035, use the form on our contact page or Book Online! Here's a list of specifications for our 7.5 tonne trucks. Please note that due to the variety of different models in our truck fleet the information above is based on averages. If you have a specific request regarding vehicle model or dimensions please contact us and we'll do our best to meet your needs. 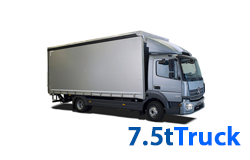 Do you need a 7.5 tonner on a weekly or monthly basis?